Well, here we have yet another Hammer Dracula movie. I must say I was a little worried as this one had no Peter Cushing and no Terence Fisher. 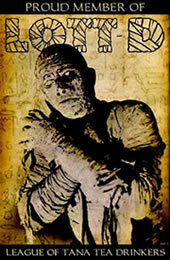 It turns out my worries were for nothing, as this film was a perfect installment to the series. The plot is nothing really new. Dracula rises from the grave (like he does in every movie), finds a new pretty maiden, and you know the rest. Let’s face it though. We don’t watch Dracula movies because we want a new story. We watch them because we like the original story. This one pulled out nothing new from its proverbial hat, but that was just fine. The ending was an interesting (and slightly ironic) end to Dracula. The only real complaint I had was the script took a little bit to pick up speed. However, it was very rewarding nonetheless. Christopher Lee proved again to be a spectacularly haunting Count Dracula. Watching these Hammer Films make me realize that Chris Lee was every bit as good as Bela Lugosi in the Dracula role. The difference is that Bela played Dracula very suave and “hypnotically frightening”, while Lee’s Dracula was emotionless and positively terrifying. Both played the monster to absolute perfection while stressing different aspects of his personality. Chris Lee has some especially chilling scenes in this movie (even more so than some of the other sequels) and Freddie Francis really plays on Chris Lee’s height to add more terror. There is one scene when Chris Lee is standing in Veronica Carlson’s window and you would swear he is 8 feet tall. 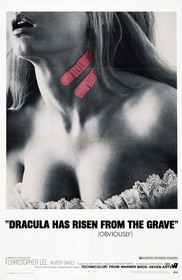 Speaking of Veronica Carlson, she played Dracula‘s latest “blood interest“ brilliantly. Beautiful, innocent, and charming, she was perfectly virgin-like for Dracula‘s tastes. Barbara Ewing gave an equally brilliant performance as the loose Zena, who is the first of Dracula‘s lady victims. Barry Andrews did a great job as the main hero of the tale. All in all, the acting was better than I’ve seen in most Hammer flicks and this truly added to the enjoyment of the flick. Recommended to the classic horror population, this film remains as one of those great Hammer gems that we all cling dearly to our un-staked heart. While some horror fans who are looking for a fresh twist on the story may find the script a little stagnant, there is enough substance to the tale to win them over. With movies like this, it’s no wonder that Dracula has risen from the grave, and will continue to rise… again… and again. Lee thought this movie was rubbish, particularly the scene where Dracula pulled a stake from his own heart. Submitted by Anonymous (not verified) on Mon, 2010-10-25 13:41. I agree that this was great movie. Poor Zena, though! Submitted by Anonymous (not verified) on Wed, 2011-09-21 17:10. I'm surprised Chris Lee didn't like this one, as I thought it was better than "Dracula: Prince of Darkness". The antagonist had a much more visible role (including speaking parts - the absence of which annoyed me greatly in the aforementioned film), there was a nice combination of horror and comedy and I for one felt that the storyline marked a departure from the 'standard' Dracula tale to which the film-makers cemented themselves in the preceding Hammer Dracula movies. Submitted by PsychoHippie (not verified) on Wed, 2011-10-05 18:58. On the scene where Dracula unstakes himself: The in-story explanation is that Dracula won't die unless a prayer is said over him. This is meant to highlight the fact that the hero's atheism handicaps him when it comes to dealing with True Evil. This despite the fact that none of Drac's OTHER killers had to do any praying. BTW...am I the only one who would have kicked Blondie to the curb in favor of Zena?